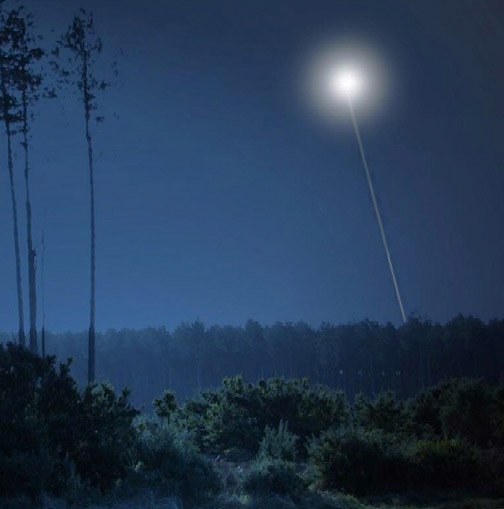 Former U. S. Air Force 1st Class Airman John Burroughs is now organizing a 2010 reunion in England for all the military personnel in RAF Bentwaters and RAF Woodbridge who were involved in the mysterious light phenomena of December 26 - 28, 1980. John would like to hear from all who were there and has created a website and email account to organize a 2010 Bentwaters reunion. Lt. Col. Charles I. Halt described mysterious aerial light that emitted white, narrow, beam down in front of him and over the weapons storage facility (above), said to contain nuclear warheads, at RAF Bentwaters, England, in the early morning hours of December 28, 1980. Illustration by Jan Roth at www.rendlesham-incident.co.uk used with permission. Gary Heseltine confirms that in the early morning hours of December 28, 1980, Col. Halt says he saw a white beam of light come from a bright, unidentified aerial object and aim downward to the RAF Bentwaters weapons storage area.